The first time I saw one I couldn't pull my eyes away. I stood there, mouth open, eyes locked, unaware of the people bustling by. It was the most beautiful thing I had ever encountered. That moment changed my art forever. The quiet calm of the sea. The glisten of stained glass windows. The swirl of the subconscious. The click that sparks an idea. There's really no way to sum up this work. My name is Karina Keri-Matuszak and I create unique copper paintings and sell them all over the world. 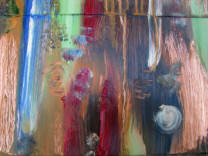 I work in other mediums too, but I am best known for my copper paintings. In fact, I am considered by some to be leading the way using this unique medium. I wasn't the first, in fact, using copper as a canvas has been around for at least 200 years, but once I discovered it, I knew it was for me. 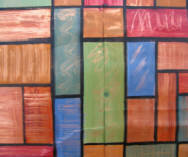 You may see other artists who use metallic paints in their artwork, but very few actually use copper as a canvas. When a piece of art is purchased, I give the owner a Certificate of Authenticity and an Explanation of Title. 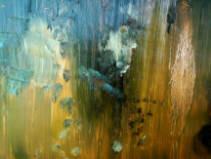 I name a painting based on personal experience and the look of a piece. Once the painting is purchased, I reveal the meaning behind the title to the owner. The only way anyone else will ever know the meaning behind the title is if the owner decides to reveal it. This way, the owner and I have a personal connection through the painting. I began selling my copper paintings on ebay in 2005. 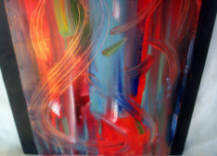 My first painting sold immediately and several others on it's heels. I began approaching restaurants and galleries with my art and was met with popularity there as well. When I submitted a painting to Staley's Grace, a restaurant in Atlanta, I had the excitement of having the owner call me before I made it home asking for a whole wall. If I sold a painting on ebay, pretty soon the owner was buying whole rooms of my art. One collector even owns 26 paintings. Now, I have had my unique copper art appear on the set of a National Television Series (College Hill Atlanta, BET Network, March 2008). My art has appeared in the book FORM 2008, Artistic Independence. My art has been featured in newspapers and magazines (with an article coming soon in Southern Living Magazine). I was even voted Best Emerging Visual Artist by the readers of Creative Loafing Magazine in 2008. Today, I continue to work on marketing my art and getting it in front of as many eyes as possible. I have always offered Art under $100, and even began offering a special "ELITE" size in 2009 for under $75. I did this in response to the economic conditions and to protect my collectors' investments in larger more expensive pieces. I have even begun offering giclees of my copper art--which becomes a whole new artform. I am always working to increase the value of my artwork. In January 2009, I was asked to be a guest speaker for the "Now What" workshop. I was asked to help explain to other new artists how they can give their art maximum exposure with marketing their art online. You see, the truth is, many artists know alot about paint, canvas, studies, and gesture drawings, but few know how to get their art out to a potential audience. I have found that I have new artists coming up to me asking how they can go about gaining more exposure too. Because of this, I am creating a guide to explain the steps an artist can take to go about this process. The book is called "THE ARTIST'S GUIDE TO MARKETING YOUR ART WORLDWIDE" and will be available soon on this site as well as Amazon.com, and even through Barnes and Noble. You can read more about my story there. And, if you are interested in knowing the second the book comes out, you can be notified by signing up for my quarterly email newsletter. I will be sending out a special email just to let everyone know when it is available. The day I saw a copper painting in 2005 was the day my art was taken to a whole new level. I'm so glad I discovered this rare and unique art form. I am thrilled to be able to offer it to you as well, so that you may experience this beautiful and amazing art form first hand.